The Italian "Task Force Air 4° Stormo" in Bulgaria was certified full operational capability for the NATO Air Policing mission "Bulgarian Horse". At the beginning of July four Italian Air Force Eurofighter jets arrived in Graf Ignatievo Air Base, Bulgaria, to fly under NATO’s enhanced Air Policing mission. The fighter jets from 4th Wing of Grosseto, 36th Wing of Gioia del Colle and 37th Wing of Trapani were accompanied by up to 110 military personnel including pilots, mechanics and support staff. After a few days of familiarization flights, the Italian Air Force detachment was certified full operational capability by NATO’s Combined Air Operations Centre (CAOC) Torrejon, Spain, on July 14. The certificate was handed over to the Italian detachment commander by Brigadier General Antonio Branco, Director of Operations at CAOC Torrejon, during a ceremony at Graf Ignatievo airbase. Addressing the Italian and Bulgarian Airmen, he thanked them for their commitment to the Alliance. "These enhanced Air Policing missions are a clear demonstration of NATO’s resolve, commitment and solidarity” Brigadier General Branco stated. The ceremony was attended by high-ranking military and non-military guests, amongst them Bulgaria’s Viceminister of Defence, Atanas Zapryanov. He personally welcomed the Italian detachment to Bulgaria and underlined the significance of NATO’s enhanced Air Policing mission. "It is a convincing example of the unity and consistency of the Alliance’s defence and operational planning” he said. The italian fighter jets are now operational and can flight together with Bulgarian Air Force MiG-29 jets to conduct Air Policing missions, air patrols as well as interception and visual identification tasks. Bulgaria is perfectly able to conduct NATO Air Policing with its assets; this enhanced Air Policing capability offered by the Italian jets provides the CAOC with more flexibility to conduct the mission. 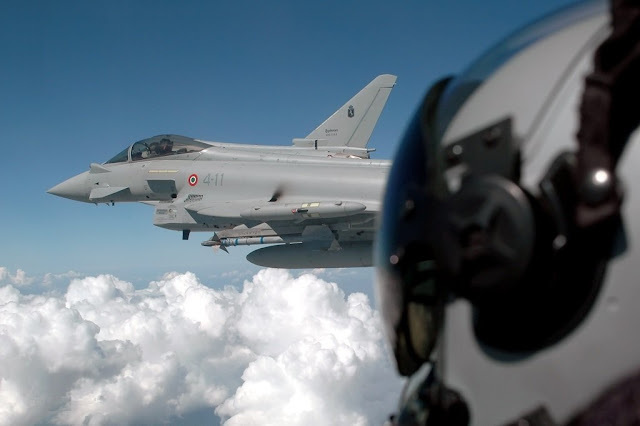 This is a time of great activity for Italian Eurofighter jets, last week they operated three interceptions in two days (More details here and here). The Air Policing is a NATO wide 24/7 peacetime mission, enhanced Air Policing is part of NATO’s Assurance Measures to the eastern Alliance members, augmenting their existing Air Policing capabilities. A detachment from the Royal Air Force is currently based at Mihail Kogalniceanu airbase, Romania, augmenting the capabilities of the Romanian Air Force (More details here). Both missions are, as is all Air Policing in general, overseen by NATO’s Allied Air Command, headquartered in Ramstein, Germany.